From less valuable parts of the downed trees are made assortments such as firewood, short technical wood and cellulose wood. 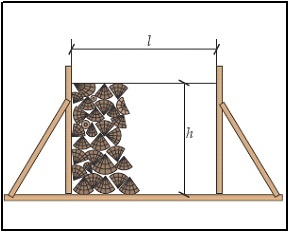 These assortments (stacked wood), put together to the stack between the pegs placed vertically, measured spatial meters which are for further manipulation converted to cubic meters using reduction coefficients. 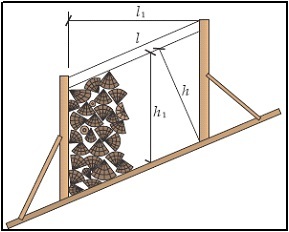 One stacked meter represents a space of one cubic meter, which is filled with complex wood and air gap, while reducing coefficient shows how much wood volume contains one cubic meter. The usual length of individual pieces stacked wood and usual height is one meter. 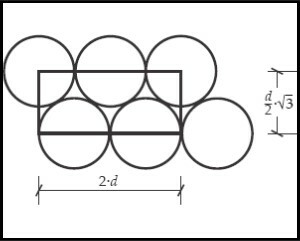 Stack on flat ground surveying according to image. On steep terrain stack can be measured in two ways (image below). Stack length can be measured horizontally (l1), and then the stack height is measured in the vertical direction (h1), or the length is measured parallel to the ground (l) and the height of normal terrain (h). Both ways to give the same volume, but in practice increasingly used the second method as a faster and more appropriate. Length of individual pieces – longer pieces are stacked poorly. 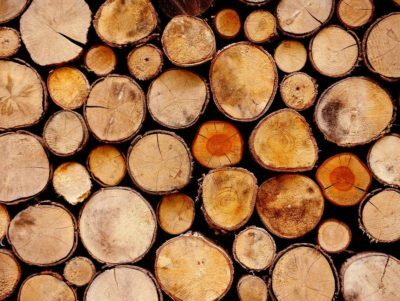 The thickness of the individual pieces – thicker pieces of wood have a greater volume than the thinner, and therefore the greater the reduction coefficient. 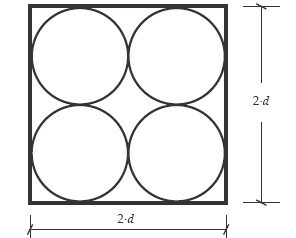 Form of pieces – lumpy and curved are stacked poorly. Processed pieces – stripped of its pieces have a greater reduction coefficient. Height of the stack, and sort order – stack heights greater than normal ( 1m ) have a higher reduction coefficient. gentleness of stack – ( this effect has a subjective character ). Normal height stack added oversize whose size is not taken into account in the measurement volume. Oversize is left to cover the loss of timber volume due from drying and should not exceed the value of the percentage of drying, its size ranges from 5% to 20% of normal height stack.